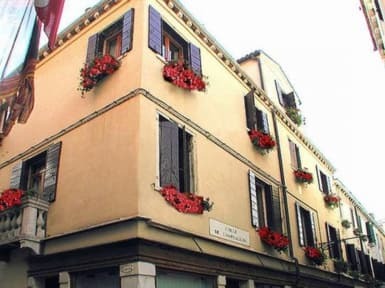 In the heart of the historical centre, a few steps away from the Rialto Bridge and Saint Mark's Square, 'Locanda SS.Giovanni e Paolo' welcomes its guests into a friendly, elegant and comfortable environment. We guarantee an unforgettable stay in the magic atmosphere of a fascinating and enchanting city. The basic triple and quadruple rooms are budget rooms in the annexe, very simple and basic. Ideal for students looking for an affordable and still clean and fully refurbished accommodation with private ensuite. Breakfast is Not included. The Locanda is an ancient eighteenth century house which has been completely renovated. We offer pleasant rooms decorated in the 1700's Venetian style each of which has air-conditioning, telephone, wall-safe and a modern bathroom with shower, sanitary units and hairdryer. The open beams of the ceilings and the decor created by the able hands of Venetian Craftsmen make every single piece of our hotel a little work of art. The luminous windows look onto the 'Barbaria delle Tole' and the 'Calle dell'Ospedaletto' in front of which is the 'Chiesa dei Derelitti', whose facade is rich with marble and sculptures. It was built as a project for Baldassare Longhena. Breakfast (fresh-baked croissants, bread-rolls, butter, jam, fruit juice, tea, coffee or hot chocolate) (non included for the Basic Rooms) is delivered conveniently by room service at the time required by the guests. For a total immersion into the atmosphere of ancient Venice what scenery can mirror the luminosity of the water and the delicate reflection of the lagoon colours? Only Murano glass and the elegance of eighteenth century style Venetian furniture which furnishes every room. This furniture is only of small dimension and a particular form. It is curved and harmonious, typical of the baroque style developed in the lagoon. Their bodies seem to fill with air and then rise vertically, almost to recall the slow rise and flow of the lagoon waters. The light colour bestows a particular luminosity on which you will see the artist's decorative fantasies of light floral decoration. Please note: No kitchen, no microwave, no boiling water for cooking. 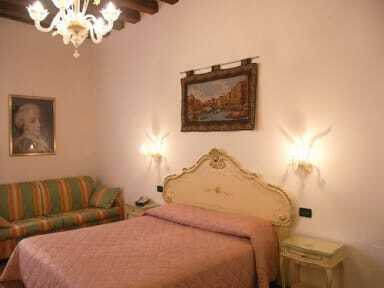 The twin room is the Economy Room of the Locanda, i.e. a quite small room with 2 separate beds (head to foot), not a double bed!. Altough nice, luminous and fitted with private bathroom, it is best for 2 boys or 2 girls looking for a budget accommodation! If you book this room please do not expect a double room! Check-in from 2 pm until 9 p.m. only (or please advise in case of late arrival).